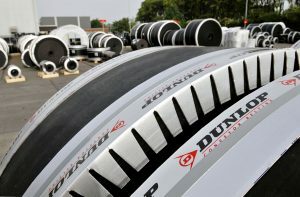 Visitors to WAMPEX 2018 can discover Dunlop Conveyor belting and service work and learn that all conveyor belts are manufactured by the company itself, which brings huge quality benefits. The modern industrial world demands ever-increasing standards of safety, quality, productivity and cost effectiveness. Dunlop conveyor belting has developed a wide variety of conveyor belt over the years to meet these demands in every stage of the production process. The company’s special products include rubber products for agriculture, rubber linings for fire hoses, pistenbulley belts, sheeting, splicing services and passenger conveyor belts for airports, skiing facilities and shopping centers. Dunlop abrasion resistant belting provides up to 50 per cent longer wear life because “the rubber covers we use exceed international quality standards by a significant margin,” says Sales Manager, Festus Nyankson. Dunlop provides an unrivalled level of customer service which includes visiting customers on-site, providing advice, guidance and practical support. “When you buy from Dunlop you get more than just quality conveyor belts because we have one of the largest, most experienced and highly trained teams of conveyor belt specialists and application engineers in the industry”, says Festus.